Coco Chanel's influence wasn't merely limited to clothes. 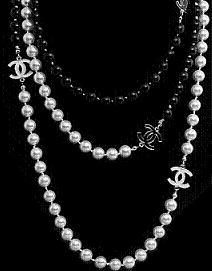 Chanel necklaces and jewelry were very popular in the 1920s. Chanel jewelry stands the test of time. It has remained in style through countless changes in fashion tastes. It's a beacon in the ever changing times of jewelry and fashion industry. What is ironic about Chanel's jewelry is that despite her adherence to a simple aesthetic in her dresses and other clothing, she used large synthetic stones and glass beads in her jewelry that can best be described as "gaudy". Yet there is a simplicity and elegance to Chanel jewelry that remains fresh and cutting edge despite the synthetic flashy stones. In the 1920's it was very common to see a well-to-do woman decked out in a long Chanel of large synthetic stones and multi-faceted glass beads. The surprising thing about Chanel's jewelry was the price. The wealthy as well as the common flapper could bedazzle themselves in the popular long necklaces of the day (the price has gone up). The beads of these 1920s necklaces were multi-faceted many various shapes and sizes. As a kid I always referred to these types of beads as "old-fashioned", but in the day they were new and exciting.Necklaces were long and draping, with some over 60 inches in length! Though Chanel and other jewelry makers made shorter ones too. Extremely popular versions of the long necklaces ended with a sautoir, which was a pendant that was often handmade by the flapper who wore them. Usually woven on a bead loom and using small "seed" beads called "flapper beads" in the 1920s. Finding quality jewelry on the Internet for a reasonable price is difficult, and there are very few websites I truly endorse for the quality of the jewelry and the great customer service I receive when ordering or if I have questions. In my search for my grandma's necklace I came across hundreds of websites claiming to sell vintage necklaces, but many of these I did not trust and so my recommendation if you are going to buy Chanel over the Internet is to do your homework first! And, if you can afford it, go directly to the boutiques for the latest styles. Real Chanel necklaces should be simple in form, obviously influenced by the Art Deco style that was so popular in the 1920s. Art Deco jewelry should give the impression of a fusion of simplicity of line, form, color, and geometry. There is an obvious juxtaposition between the materials and the form. Chanel is famous for using plastic in $2,000 pieces. So there it is, my rundown of my grandmother's lost necklace that I found on the Internet, and my take on the beautiful styles of Chanel's 1920s necklaces.